The fun in selecting stories for this series is often finding something I might have overlooked otherwise. The legend of Hereward certainly fits that! It even led to a mystery across the Atlantic. I admit short selections are looked at first as they are more easily read (and posted) online. 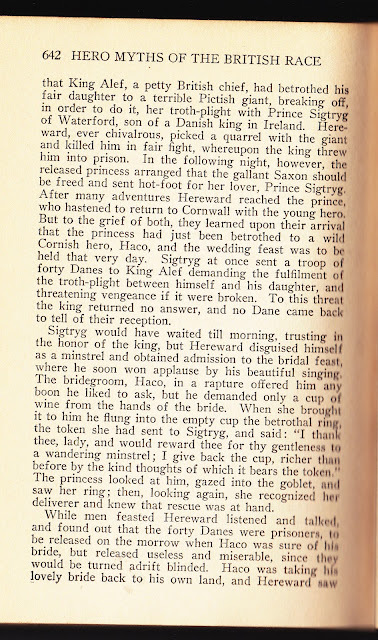 This brief tale combines adventure with the best tales of princesses forced into an unhappy marriage. I'm told most English, either now or at one time, heard of Hereward. As an American, I confess his story was new to me. It's found almost at the end of Thomas Bulfinch's The Age of Fable, which is part of Bulfinch's Mythology. 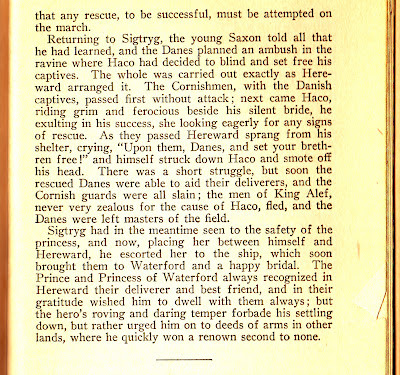 Yes, I would re-tell it differently and wonder why, in the second paragraph, Bulfinch felt it necessary to tell there how Hereward met his end? Yet I mainly agree when he says, "If Roland is the ideal of Norman feudal chivalry, Hereward is equally the ideal of Anglo-Saxon sturdy manliness and knighthood." So maybe you would prefer saving that second paragraph for the end after reading the first paragraph and the story that starts in the third paragraph? Did you notice the princess is never named!?! That's where my own mystery began. When I went to learn more, I found she wasn't totally helpless in all of this. She stole the giant's magical sword that always kills and secretly gave it to Hereward. That I could find, but trying to find her name left me feeling like Alice falling down the Rabbit Hole of Research. Since the legend is based on historical fact, I was prepared to research and, if necessary, ask for reader help. 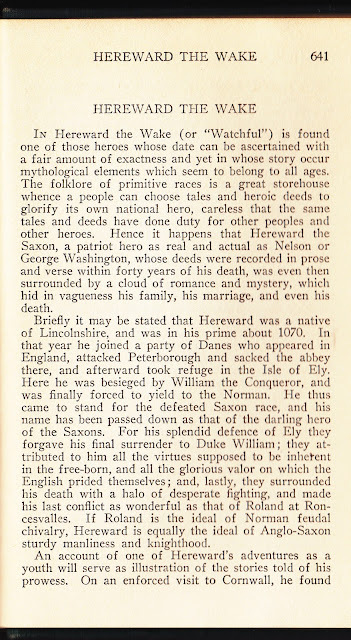 Depending on how curious you are, Ely Online has a readable online article giving even more interesting glimpses into the story of Hereward. Many of Hereward's adventures took place on the Isle of Ely. Find fast facts at his page at Middle Ages.org.uk -- a quick but broad reference site on the Middle Ages. Wikipedia says Hereward also was known as Hereward the Outlaw or Hereward the Exile. The 'true' history of Hereward the Wake is on, Distracting from the Now, a blog about the Middle Ages history and literature. Comments on "Distracting..." point out "the author of the Gesta used two eye witnesses and a bio written by Hereward's priest to put his bio together." A scholarly view is offered by Rolf Bremmer in The "Gesta Herewardi": Transforming an Anglo-Saxon into an Englishman . If, after the more factual approach, you still want more about Hereward or some storytelling background material on Hereward and Bulfinch's story, two more sources exist that say much more, but use a fictional style. You may go to this story from Robin Hood and Other Outlaw Tales, edited by Stephen Knight and Thomas H. Ohlgren. (Wikipedia even claims some Robin Hood stories may have either been influenced by or originated in Hereward stories.) 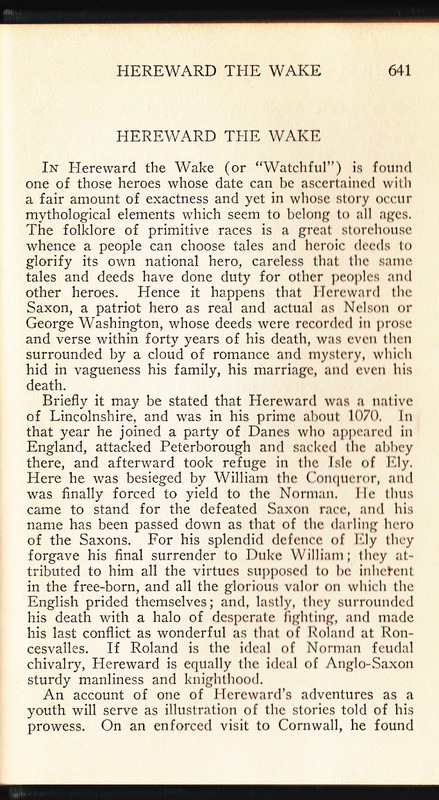 Project Gutenberg has the entire book, Hereward, the Last of the English, by Charles Kingsley, which Wikipedia says elevated Hereward to a national hero in 1865. Still no princess named! 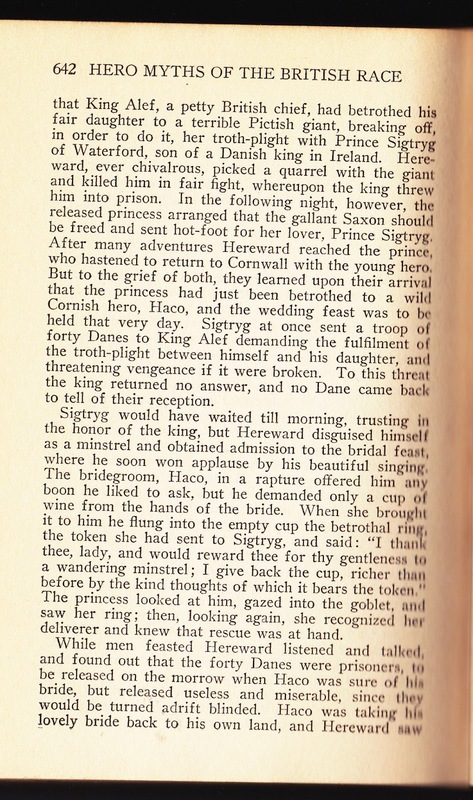 Then I remembered Jill Lamede, whose delightful Tales of the Tintagel Dragon is now available on Kindle. I had bought from her a hard copy of the book years ago, ordering it for Mount Clemens Public Library so I could tell it. It's still there and I finally remembered her saying another name for Tintagel was Land's End. That's Cornwall! 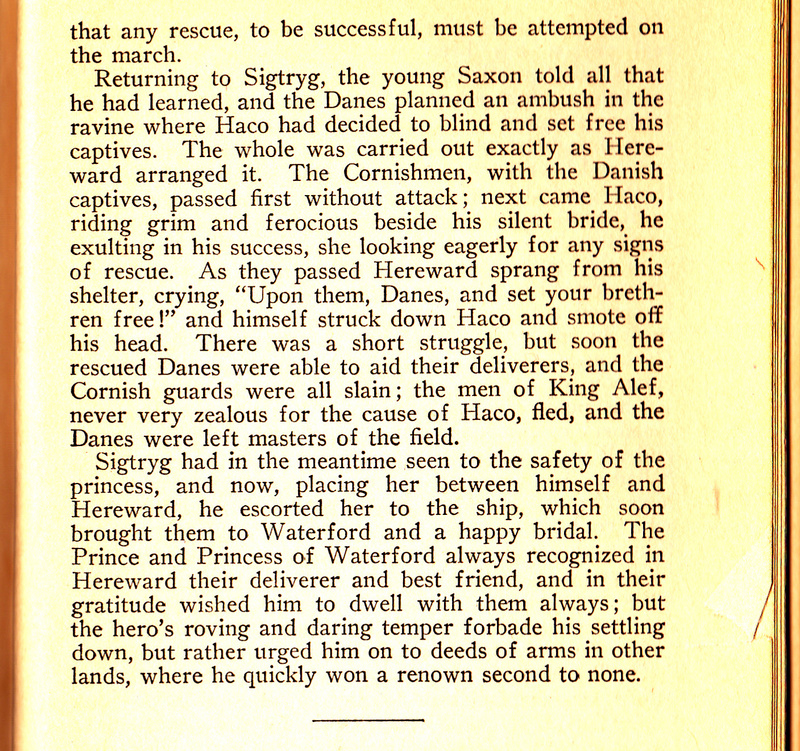 She found at Forgotten Books a truly forgotten book, The Story of Hereward the Champion of England by Douglas C. Stedman, whose preface gives excellent resources used. He says her name is "Margaret." My only concern was the Wikipedia article doesn't mention Stedman and I would have expected him mentioned. My own search reassured me by showing he was active in the early 20th century in the Viking Society for Northern Research, founded in 1892 and is the world’s foremost learned society in the field of medieval Scandinavian and Northern studies. So much for my choosing a "short selection." After all, this blog is named Storytelling + Research = LoiS.